I'm not one to shy away from white after Labour Day because I like wearing white all year long. It may have something to do with my minor obsession with white (if you've ever seen my house you'd know what I mean #notstainproof). There is just something so beautiful about the simplicity and purity of white - I can't help but gravitate towards it. When I saw this stunning jumpsuit by Laudem Deo, I knew I had to add it to my wardrobe. It worked so well in Mexico and I know it will come in handy for the upcoming holiday season. If I can wear something that feels like pyjamas and get away with looking super elegant at the same time, I'm all over it! So for this fall and upcoming winter season, be bold and break some fashion rules - wear your whites all year long. How do you feel about wearing white all year? Hola Rina muy buenas tardes! Vas espectacular, me ha encantado el look que llevas en blanco el jumper es precioso y los detalles enamoran al igual que las fotos que me encantaron todas. Un fuerte beso. xoxo thanks as always Mery! That is such a gorgeous jumpsuit. Its so pretty and you wore it so well. I love white too! Probably my favourite colour to wear! This jumpsuit is amazing, it looks so great on you! Thanks Alyssa, I love white! I am drooling over that white jumpsuit. That outfit should be worn whenever. Stunning! Hehe I agree! Thanks babe! White is beautiful and peaceful. You look awesome beauty! Such a stunning look!! You look amazing! White is such a gorgeous color in fashion, it goes well all of the year and I love how that dress looks on you! Love this white look ! You looks fabulous. This jumpsuit is so pretty. I love all white looks but sadly I can't pull them off. How come babe? I bet you could rock it and look fab! You look fab and your white dress is everything!!! Me too Audrey! Thank you! You look absolutely amazing in this total white look! This is definitely your colour! Yes, i adore this look! Love it even more seeing its a jumpsuit! Totally loved this. All white is so gorgeous. I love the all white look, and you look stunning in this jumpsuit. Thanks beauty! I do love a good all white look too. I do hope to slowly add some pops of color to my home. It's easier for christmas because I have lots of accent decor that contrasts all the white, it's my favorite decor of the year! Yenno what Alice, I stain everything toO! lol I just wear bibs and be as cautious as I can but if I do stain it I have an awesome stain remover regime! Thanks Andreea! Hope you're having a great week! Thanks Irene! Hope you're having a good week! Yes to wearing white all year round. You look very chic! This is such a beautiful outfit! Gorgeous dress! Thanks Rachel. It's actually a jumpsuit, hard to tell hey! Wowwwwww, Wowwwwww You look Divine. White looks so good on you. Stunning babe! Thanks Raysa! You're so sweet! White is definitively a color to wear all year long. I love this look you are wearing here! So classy and chic! Thanks Carmen. I ttotally agree! Such a gorgeous dress.You look like a goddess in this. 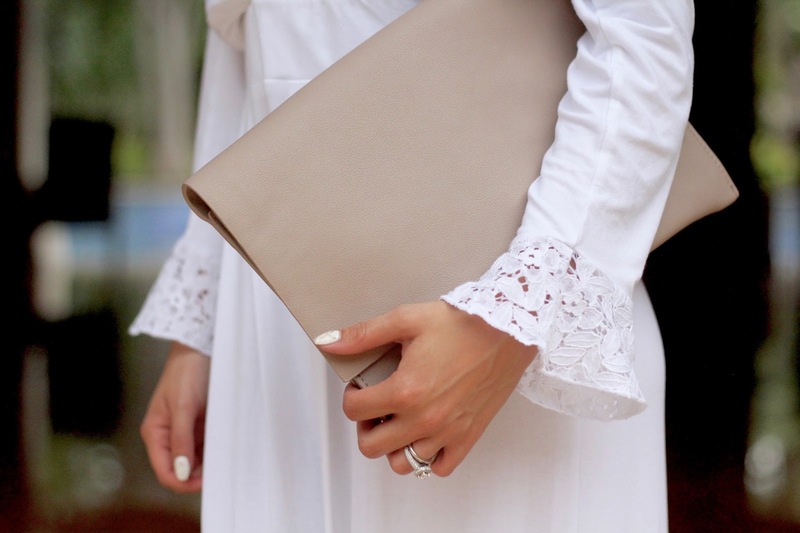 I love white, its such a classy colour and is perfect for all year! I do too, totally agree with you! Hola Rina, estás muy guapa, precioso vestido el que llevas y los zapatos me encantaron. Un besazo.